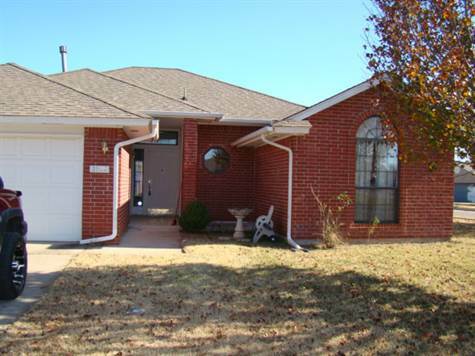 Quail Ridge, Moore - Available 8/8/2014. DO NOT DISTURB OCCUPANTS. 3 bedrooms, 2 full baths, 1569 sq ft (est. ), 2 car garage, built in 1996 on a corner lot in the Quail Ridge Addition. Open floor plan, fireplace, 10’ ceilings in kitchen/dining areas, master suite has a separate tub & shower; double vanity & walk-in closet, utility room. Fenced yard with a covered patio. Moore Schools. Rent: $1,225. Deposit: $1,225. Pet Deposit: $300-$500 per pet - No Cats.